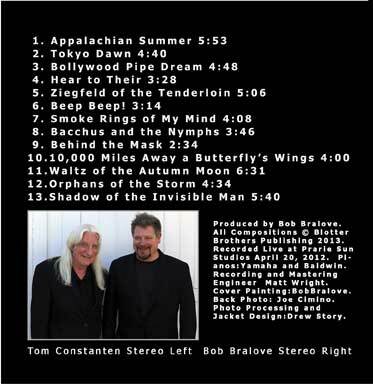 Bob Bralove and Tom Constanten crossed paths in the psychedelic swirl of the Grateful Dead. Tom, a keyboard player with the band in the late 1960's and early 1970's while Bralove was the MIDI Wizard, song writer, musical contributor to the Drums and Space section of the show and a producer for the band from the late 1980's until the band stopped in 1995. This gave them a shared foundation in rock improvisation. Both of them studied formal composition and are well versed in the language of the musical avant-garde. Constanten studied with Stockhausen, Berio, and Milhaud. While Bralove studied with Pulitzer Prize winner Wayne Peterson, before working with the Grateful Dead, Bralove was helping to craft the hits of Stevie Wonder. The melodic phrasing and rhythmic sensibilities of Bralove seem to meld magically with the musical abstractions of Constanten. 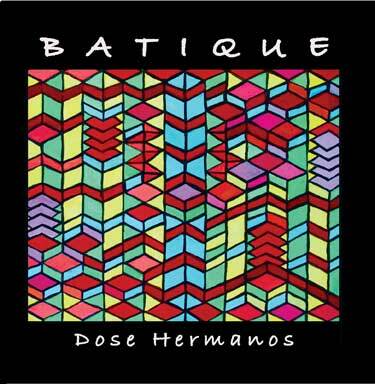 They have been playing together on the stages of the USA and Japan for 17 years and "Batique" is their first CD exclusively performed on Acoustic Pianos. Their musical connection, which was forged in the heat of psychedelics, is amazing. They seem to have a compatibility, which does not negate their differences but enhances them. Their musical influences and references are numerous but their sound is unique.